This blog has covered a lot of fancy things like taking apart a bottom bracket, adjusting various components and building trailers. But I just recently realised that one of the basic things was never covered, like how to remove a bicycle wheel. For people like me who fix bikes it's pretty darn obvious, but I realise that for some of you it's not. So let's get cracking! Removing a wheel is easy once you know a few things. The front wheel is the easiest to remove. Simply unbolt the nuts, pull the washers and you are done. The only thing to remember is to remove a brake pad to clear wide tires. Just one should suffice, it will avoid you the trouble of disconnecting the caliper and having to reajust it afterwards. Ajusting just one pad is much simpler. When you put the wheel back on, it is much better to have the bike and wheel sitting on the ground. This way you will be certain that the axle is sitting even in the fork and the wheel won't be crooked. Another way to find out if your wheel is on straight is to look and see if the center thread of the tire is aligned with the caliper hole in the fork. The rear wheel is another story. Depending on what type of bike you have, there are some things you have to know before removing the wheel. Let's check it out one type at a time. One speed coaster brake First thing to do is to remove the bolt that holds the brake arm to the bracket on the frame. 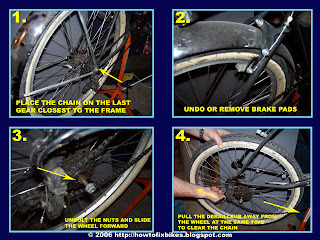 Then untighten the wheel nuts, wiggle the wheel to slacken the chain and remove the wheel. When putting the wheel back on, make sure the brake arm is aligned with the bracket and put the chain back on the gear before. 3 speed or more internal gears Disconnect the cable to the hub mechanism before you do anything. Do the same thing as the coaster hub wheel to remove and reinstall it. Multi speed derailleur Make sure that the chain sits on the last gear closest to the frame. Unbolt the wheel and push it forward while pulling on the derailleur cage. The wheel should slide right off. When reinstalling it, put the chain on the last gear again, pull the derailleur cage and slide the wheel back in place. When putting the wheel back on in all 3 cases, start by bolting the right nut(The one on the side of the chain) as you make sure you have proper chain tension for coaster and inner speed hubs and that the axle sits at the very bottom of the drop out hole for derailleurs. Once that nut is tight, grab the wheel near the pedal axle and align it straight with the bike frame. While you're holding the wheel in place, tighten the left nut. I'm from México City, I found your blog and I think its very interesting and useful. Im planning to build a bike, im not sure if I will build kind of chopperbike or like a 60's bike you know. But at least Im going to visit your blog very oftenin order to know how to keep my ride in good conditions. Greetings from Mexico. I'm glad that the blog is helping you out. Go check out the bikes on the rat rod bike forum, you'll see many bikes being put together. Lots of amazing stuff nad inspiration. my english is not good.tank you very much! I just became extremely interested in road bike riding. I found an old road bike in my garage that my Mom used when she was younger. It is in extremely good shape and I'm starting to fix it up. I come to this page a lot to look up what you have to say! Next month, I think I'll venture a paint job on my new baby. Hello Grace, I'm happy to read that this blog got you riding again on what seems to be a great bike. Thank you for your comments. Hello Gerry, my name is andy and i couldnt help notice that you didnt have any links that shows how to replace spokes or install new spokes because i am about to replace my spokes with new red primo forged and i have no clue on how to replace them. i hope u can show me how. i would like that. Hello Andy. I would suggest the lazy man's technique for replacing your spokes, just replace them one at a time. However, you will have to get the wheel aligned, or trued, after you do this. thanks for the info. one question: does the front wheel have a "front" and "back"? I.e., when i put it back on does it matter which direction? i have an old road bike, nothing fancy, no quick release. Hey vavavoom, if there is no direction arrow on your tire, the front wheel can be put back on in any direction. If you do have a direction specific tire on however, make sure the arrow on the sidewall of the tire points forward when you re-install.